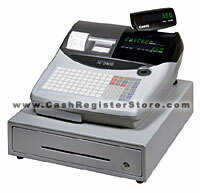 The stylish Casio TE-2400 cash register is a great cash register for the hospitality environment. Many options are readily available including scanning, remote printing, PC connectivity, and a 2nd cash drawer option. The TE-2400 now can be equiped as a 2 drawer cash register system. Assign employees to a given cash drawer to help reduce theft and errors. The TE-2400 has the option for an interfaced credit card reader. Enter in transactions at the register, slide the card and print out the ticket on the receipt printer. Eliminate double-entry errors so common on stand-alone machines once and for all. The new TE-2400 Casio cash register features flash card technology. Utilizing flash cards gives the cash register operator 3 distinct LOW COST advantages. The Casio TE-2400 cash register standard features include a 70 plu flat spill-resistant keyboard, high speed thermal receipt/journal printers, a heavy duty metal cash drawer with media slot, 70 standard department keys, and 2 RS232 ports to interface added perhiperals. For example, add a remote printer to send orders to the kitchen! Yes, get many of the higher end Casio TE-4500 features at half the cost!